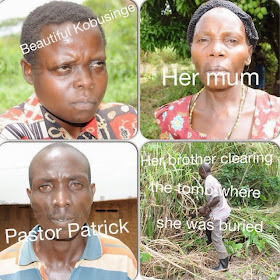 There was panic and pandemonium in the village of Nkakwa in the Hapuyo Sub County in Kyegegwa district of Uganda, when a woman who 'died' and was 'buried' in 2004 resurfaced, reports New Vision Uganda. According to the online newspaper, the woman, Apolonia Kobusinge, was sighted in a bushy area in a neighbouring community of Kabasekende village in Busamiramira sub county, Kibaale district, by residents who arrested her and took her to police on suspicion that she was either a criminal or a mentally troubled person. "Pastor Patrick Sewante of The Lord Jesus Foundation, Wells of Salvation Church, said that when Kobusinge was arrested, she looked weak and could not talk but he decided to pray for her so that she could recover. Little did he know that Kobusinge had 'died' and had been 'buried' way back in Kyegegwa in 2004. Sewante said that it was after spending almost two years with Kobusinge that some people went to him and alerted him that Kobusinge had died in a road accident and was buried in 2004. He did not believe this until her relatives came to his church and confirmed that this was the person they buried over a decade ago. I was surprised but due to the power of God, continued to pray for Kobusinge and I am only waiting for the relatives to come and pick her." Her 54-year-old mother, Femia Kamaransamba, was also taken aback at the discovery and positively identified the woman as her long dead daughter. She said they were stunned when they saw Kobusinge and after critical examination, they concluded that she was the exact person they had buried a decade ago. "Before her death, she had a scar on the upper lip and one toe had a faulty nail and everything was the same after examining her."